My friend Ira and I drove two days from Portland to bask in the Arizona sunshine and, more importantly, start the 2017 season right. Ira is a lifelong Cubs fan, having grown up in Chicago, so it was only fitting that we begin with a Cubs game. But first we had to get there – to Mesa, that is. We drove south through Oregon on I-5, which is okay after you get past Salem, but not entirely inspiring. So after we convinced the border guards in California that we were not vegetables (good thing they didn’t ask some of our family members!) and therefore not subject to confiscation, we turned east just past Mount Shasta and headed towards Nevada. That went pretty well – beautiful and not too many people. But the second day wasn’t so great – some traffic in Las Vegas and a one-hour halt south of there for road construction put us off our schedule. Because of the winter that the west coast has had this year, Nevada and Arizona, which are congenitally brown, were eerily green everywhere we looked. There were even wild flowers growing beside the road. But I digress. 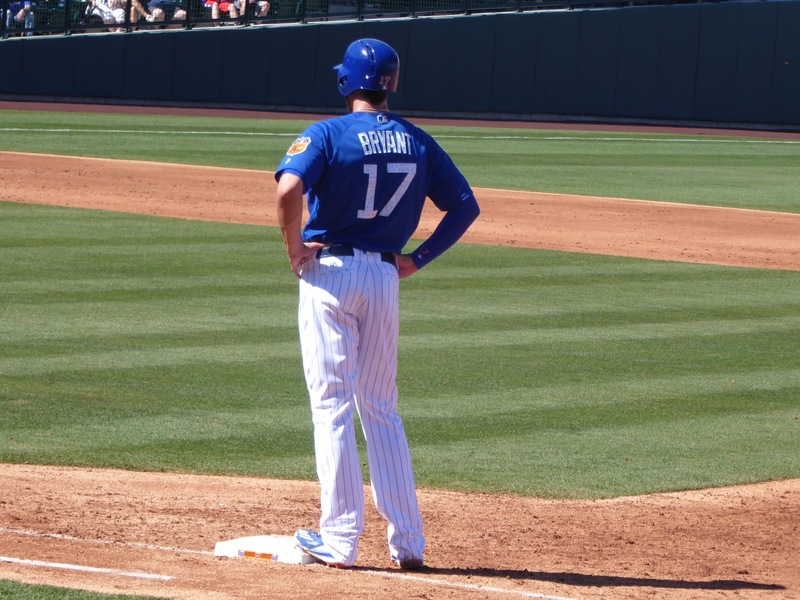 We went to Sloan Park (sadly, the Cubs no longer live at Hohokam Stadium for spring training) early to watch BP. 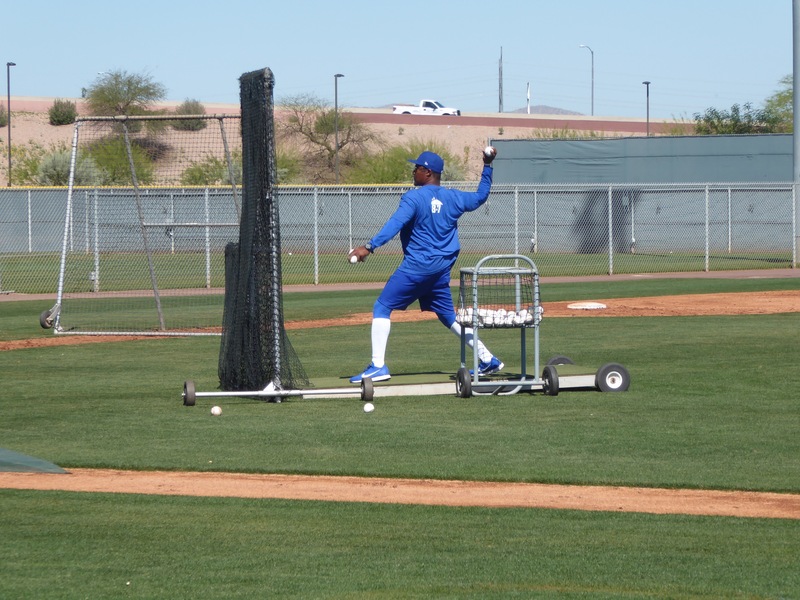 You may wonder how hitting 60-70 mph pitches can really help hone a batter’s skills. I don’t know the full answer to that question, but as you can see, the BP pitcher is almost halfway to the plate from the mound, so the batter has to decide pretty fast. We were joined by my son Eli to watch as the Cubs played the Brewers on a beautiful, if hot, day (game time temp was 91 degrees, and the field announcer took great delight in pointing out that it was 22 degrees and snowing in Chicago). 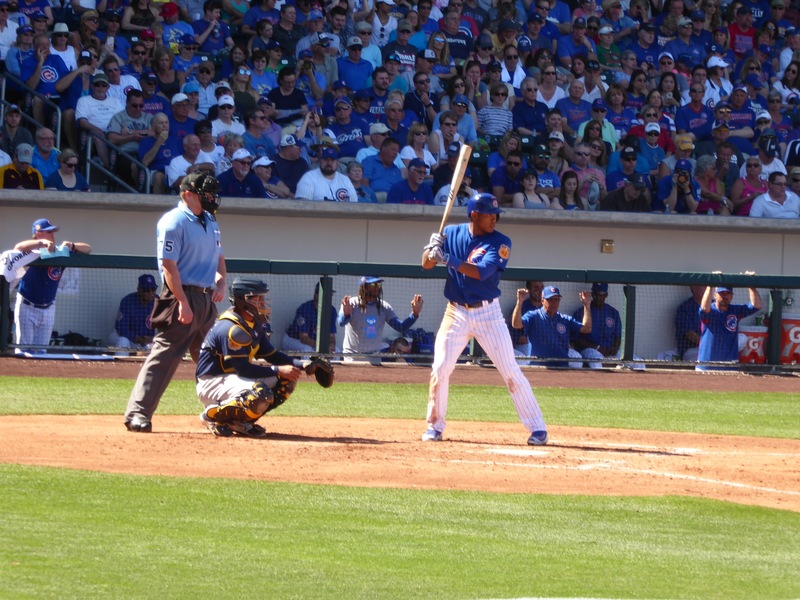 Nearly all the Cubs stars started the game and Kris Bryant got it off to a good start with a dinger. The Cubs dominated, despite three caught stealing, and led 6-2 at one point. 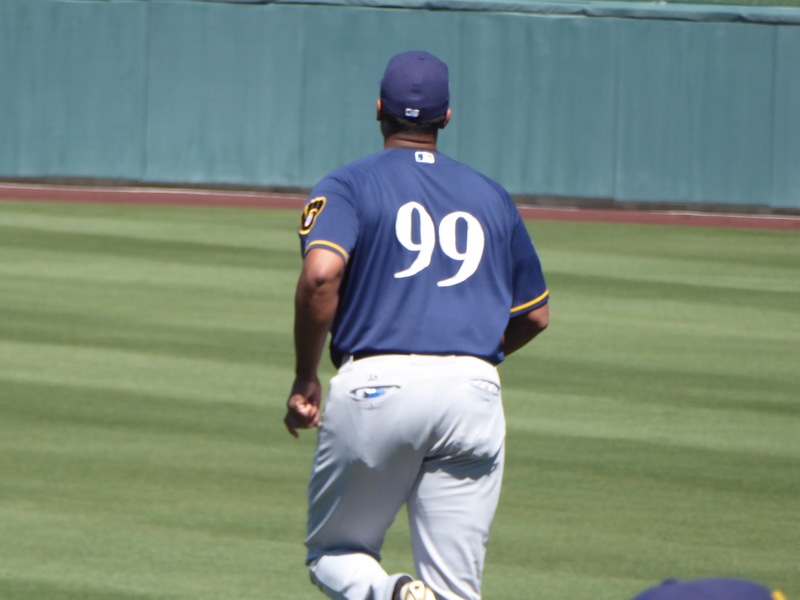 But the Brewers came back and, thanks to a throw from left by an unnamed rookie that was airmailed into the stands, went ahead 7-6 in the top of the ninth. Cubs tied it with another homer in the bottom of the ninth and that’s the way it ended. Can you imagine – they don’t play extra innings in spring training! 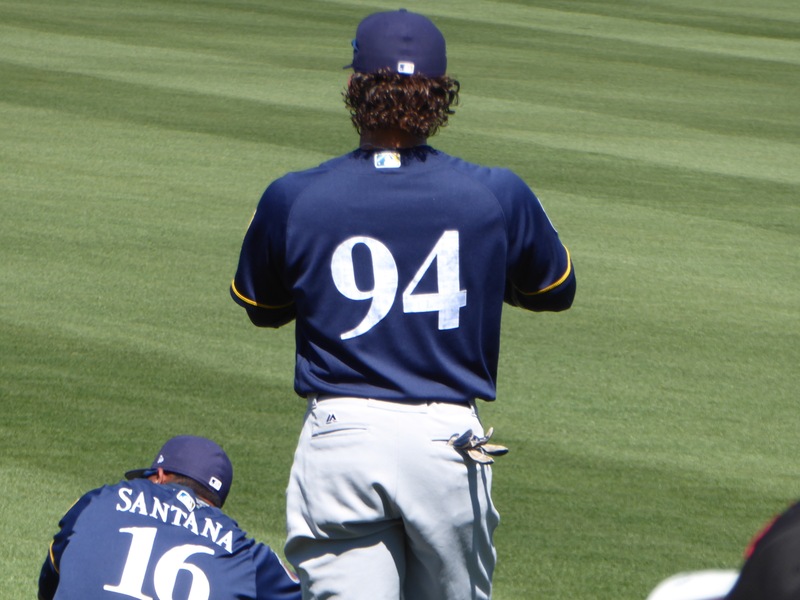 One interesting feature in spring training is the mixture of veterans and rookies. Typically the veterans start and play a few innings before the rookies get a chance to show their stuff. 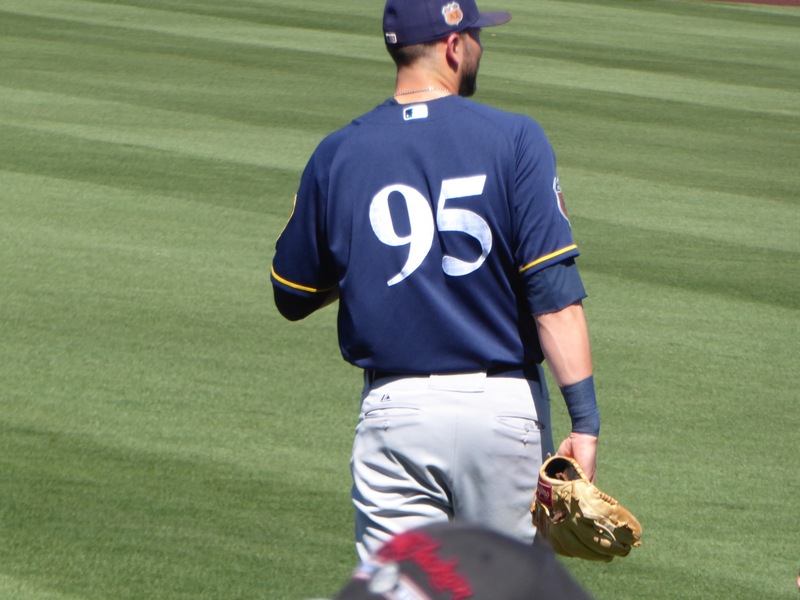 You can tell who’s who by their numbers – rookies have high numbers and, at least for Milwaukee, don’t get their names on the back of their jerseys.